In approved places, every story serves a purpose. But forbidden books are so much more. Some of them are webs; you can feel your way along their threads, but just barely, into strange and dark corners. Some of them are balloons bobbing up through the sky: totally self-contained, and unreachable, but beautiful to watch. And some of them- the best ones- are doors. 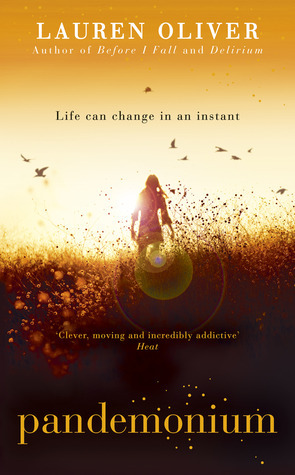 What a wonderful follow up novel to Lauren Oliver’s dystopian, Delirium. Where many sequels flounder or just fall flat, Pandemonium delivers and grows on its predecessor. The novel is split into alternating chapters of “then” and “now”. The “then” chapters complete the tale of what happens to Lena after Delirium finishes and she is fighting to escape and survive in the Wilds without Alex. The “now” chapters show Lena back in society as a Resistance agent. Delirium left you on such a cliffhanger, I needed to know what happened next. Oliver managed to deliver a sequel where she strung you out the entire book before giving that information. Normally this is something that would have left me twitchy and irritated, however the book is just that good I never once felt exasperated at all. What you get is a book that isn’t shy of being harsh and painful. It makes you think twice about about how we behave as individuals and shows the strength and resiliance of humanity regardless of what is thrown at them. Where Delirium explores Lena’s growth and love, Pandemonium is about the darker emotions like hate and revenge all of which are still considered part of “the” disease, amor deliria nervosa. If he were less well trained, and less careful, he would say hate. But he can’t say it; it is too close to passion, and passion is too close to love, and love is amor deliria nervosa, the deadliest of all deadly things: It is the reason for the games of pretend, for the secret selves, for the spasms in the throat. There were many scenes in this novel that deeply impacted me, often by what Oliver leaves unsaid, once scene in particular with Raven, Blue and Lena left me in tears it was so harsh and beautiful. The writing is just superb, I can’t fault it. Where Crossed so desperately tries to be poetic, deep and meaningful and falls short at the mark, Pandemonium delivers in spades. The story and writing is fluid, soulful you really empathise with the characters and can feel the hopelessness and uphill battle of trying to change their society. Lena really grows in this novel, she states that the old Lena is dead and in some ways this definitely feels true. The new Lena is much tougher after surviving the wilds and joining the resistance. She at times seems numb and dead due to the shock of losing Alex and her entire way of life. There are a few new secondary characters introduced who are well done and really enhance Lena’s journey through the Wilds and I can’t not mention Julian, her new love interest. I wanted to dislike him, I really did but I just couldn’t. Julian, like Lena is all about discovery, growth and acceptance that they are different to the rest of their society. He is sweet, he is genuine and I really felt for him and could see the love blossoming between them even if Lena resisted and battled it. I can’t sing this series enough praises. If you haven’t read Delirium yet, please go pick it up and get as hooked on it as I am. 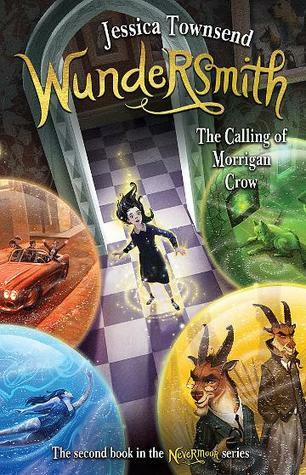 Pandemonium is a wonderful sequel and I am on tenterhooks just waiting to see how everything comes together in the final book! – Such a great continuation on Delirium – love it!